Meals for Mutts Natural Organic Shampoo is a special formulated shampoo for dogs with sensitivities and allergies. It is a unique blend of milk, honey and coconut. It penetrates deep in the shaft to restore shine and smoothness. The natural organic shampoo strengthens and hydrates your dog’s fur. The therapeutic effect of essential oils in the shampoo relaxes and soothes your pet, while the added vitamin E and B-12 relieves skin irritation. 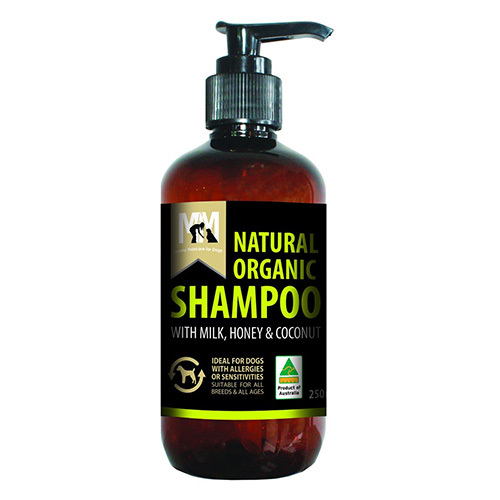 The natural shampoo is free from chemicals and non-toxic to animals and environment. It is a perfect grooming product to clean and add shine to your dog’s coat. Apply a small amount to your hands and then work into the coat and create a cleansing lather. Rinse thoroughly and apply conditioner. Do not allow shampoo to get into your dog’s eyes.